The CityLifeStylist: Stop the Flood; Go Green! Filipinos are starting to rebuild their lives after the two typhoons that hit the country. The effects of these calamities have served as another big wake-up call for all of us to do our part in taking care of our environment. As they say, a little goes a long way, and the first thing to do is to begin with ourselves and our lifestyles. I'm starting off this little "green hunt" with bath products, skin care and makeup. Our home is never without a bottle or two of Tea Tree Oil. It's very effective in fighting infections. It disinfects wounds, and even dries out stubborn pimples. Gargling warm water with a few drops of it helps cure a sore throat. Read about its other uses and benefits here. I don't usually stick to one bath soap (except for my facial wash) but I've tried The Body Shop's bath and shower gel before and liked it a lot. My pick is Pink Grapefruit, which leaves a squeaky-clean feeling and a fresh, fruity scent on your skin. 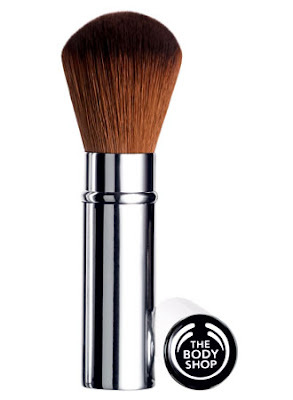 My mom and I both have their retractable brush, which we looove because it's soft and doesn't irritate our skin. It's very handy as well. I always have it in my bag! I immediately switched from lip balm to lip butter when I tried their Gurana Lip Butter. I liked its buttery (but not oily) feel on my lips better, although their Born Lippy lip balm is still a bestseller. The Body Shop's Glow Enhancer is one of my favorite makeup items because they instantly brighten my complexion. I just dab a little on the apples of my cheeks after face powder and I'm good to go. Discover more about The Body Shop here. More eco-friendly features to come!